Flood Bros. Disposal presents The Skinny & Houli Show and Houli kicks off the show with a crazy anecdote about trying to get in to see TV spokesman from Shark Tank Kevin O’Leary, AKA “Mr. Wonderful” at the Rosemont Theatre and being snookered by a real estate scam. Then the lads welcome Jimmy Callahan to the show. 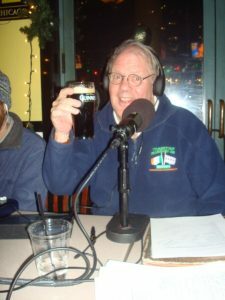 Jimmy is a Guinness Brand Ambassador and brings his passion for Guinness and the entire beer industry to tonight’s show. This guy knows more about beer than most gynecologists know about beauty! He’s also an acclaimed commercial actor and Second City veteran, who knows how to tell a great story while handing out free brews, what more can we ask? Tune in to learn a thing or two!